Is your football team looking for a new strip or towels in your club design? Would you like to have shirts made for your band for the next tour? Are you and your colleagues training for the next marathon in your city? Whatever your situation, perhaps you don't want to order just any products but you want to know where they come from and be sure that they have been produced in sustainable conditions and to high quality standards? We'll take care of it! 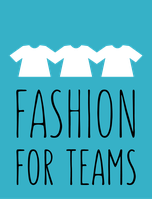 Fashion For Teams can supply a large selection of products, ranging from T-shirts, sweatshirts, pants, caps, socks and bags right through to home textiles, such as bedding or towels, offering a wide choice of different qualities of fabric and meeting your exact specifications, including printing or embroidery on request. * Do something to boost that team spirit which engenders lasting relationships and partnerships – transparent, efficient and uncomplicated.